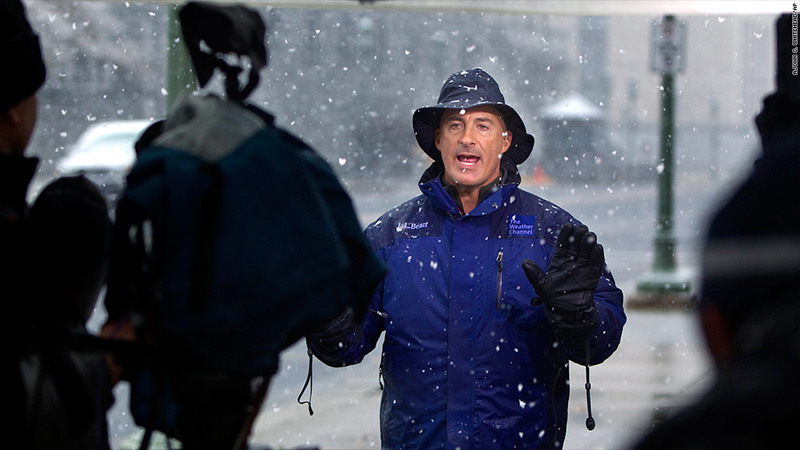 The Weather Channel is using a letter from meteorologist Jim Cantore, who warns viewers will lose "potentially life-saving information" in a blackout. The Weather Channel disappeared from DirecTV's channel lineup shortly after midnight on Tuesday, the latest escalation in a contentious contract negotiation. DirecTV (DTV), the biggest satellite television distributor in the United States, appears to have replaced the Weather Channel with WeatherNation, a 24-hour channel that DirecTV has been promoting as an alternative. "This is unprecedented for the Weather Channel," said David Kenny, CEO of the Weather Channel's parent company. "In our 32 years, we have never had a significant disruption due to a failure to reach a carriage agreement." Usually when cable channels and distributors go to war over money, the two sides warn customers that a blackout will be inconvenient. This time, the Weather Channel is saying it'll be downright dangerous. The channel has tried to rally the public's support by reminding people that it is an emergency lifeline during severe weather. "The Weather Channel isn't just another TV network. It's a must-have resource that keeps families safe," proclaimed a headline on Weather.com. At stake, the channel wrote ominously, is a "critical life-saving community resource" for 20 million households. The Weather Channel is publishing messages of support from residents in tornado-stricken communities and representatives of emergency management groups. It is also circulating a letter from Jim Cantore, a famous meteorologist for the channel, that says it would be irresponsible for DirecTV to "deny their viewers access to critical and potentially life-saving information in times of severe weather." The strategy is provocative, since it paints DirecTV as unconcerned with the safety of customers. Kenny, in an interview conducted before the blackout, said that the strategy "is a strong compelling argument, and I think it resonates because it's true." DirecTV, of course, strongly disagrees. Dan York, the company's chief content officer, said Monday afternoon that "things have been relatively quiet" between the two sides and that a "significant gap" remains. "But we're hoping that we can find a way to come to terms," York said. York and other DirecTV executives say that, contrary to the Weather Channel's positioning, there are many other sources for urgent weather news these days, including WeatherNation. "When information is readily available everywhere, it's no longer necessary for people to have to pay a premium," York said in a telephone interview. He also asserted that the Weather Channel devotes up to 40 percent of its programming schedule to "reality TV shows." The Weather Channel said the cutting remark about reality TV shows is unfair because it recently recommitted to live coverage and sidelined some of the taped programming that frustrated loyal viewers. Typically when these disputes break out into public view, it's because a channel owner is demanding a steep increase in the price paid for a channel. York declined to get into the specific financial terms, but said the Weather Channel's desired increase is "substantially more than that" one-cent figure. The Weather Channel went public on Friday with the campaign against DirecTV. The company said its anti-DirecTV Web site has received more than 700,000 page views and generated about 150,000 phone calls to DirecTV's phone banks. While York disagreed with the claims put forward by the Weather Channel about possibly depriving viewers of emergency information, he acknowledged this: he has never seen a marketing campaign like it.